Dental Update: Issue - Article: Fixed Versus Removable Appliances – Which One to Choose? 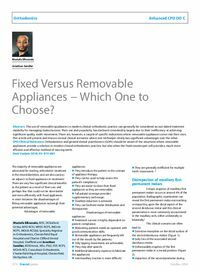 Orthodontics: Fixed Versus Removable Appliances – Which One to Choose? Abstract: The use of removable appliances in modern clinical orthodontic practice can generally be considered an out-dated treatment modality for managing malocclusions. Their use and popularity has declined considerably largely due to their inefficiency at achieving significant quality tooth movement. There are, however, a couple of specific indications where removable appliances come into their own. This article will present and discuss several clinical scenarios where one technique clearly has significant advantages over the other. Clinical relevance: Orthodontists and general dental practitioners (GDPs) should be aware of the situations where removable appliances provide a solution in modern clinical orthodontics practice, but also when the fixed counterpart will provide a much more efficient and effective method of moving teeth. Author notes: Mustafa Elhussein, BDS, DClinDent Ortho, MFD RCSI, MFDS RCPS, IMOrth RCPS, MOrth RCSEd, Specialty Registrar in Orthodontics, Chesterfield Royal Hospital and Charles Clifford Dental Hospital, Sheffield and Jonathan Sandler, BDS(Hons), MSc, PhD, FDS RCPS, MOrth RCS, Consultant Orthodontist, Chesterfield Royal Hospital, Chesterfield, Derbyshire, UK. Objective: To understand the limitations of removable appliances and know when it would be more efficient to use a fixed alternative.